Goldenrod is a member of the sunflower family that is native to Europe, North America, South America and Central Asia. 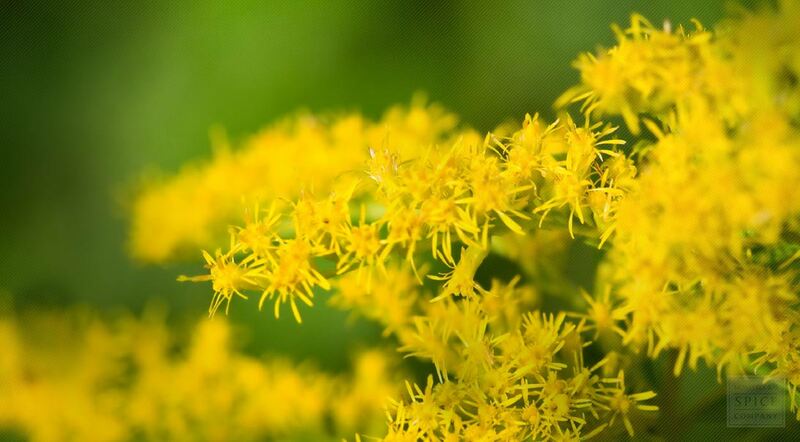 Its genus name, Solidago, is a reference to the ability to make whole or cohesive. The fresh leaves and sunny yellow flower heads are used to produce a yellow dye. The dried leaf renders its astringent, bitter qualities to teas, infusions, tinctures and extracts. The plant also contains natural rubber, and provided the raw material to outfit the first Model T automobiles with tires. Goldenrod is a member of the Asteraceae family and is an upright, clump-forming perennial that typically grows to 3' tall. Its yellow flowers bloom from July to September. Solidago species are perennials growing from woody caudices or rhizomes. Their stems can be decumbent to ascending or erect, ranging in height from 5 to 100 or more cm. Some species have stems that branch near the top. The basal leaves in some species remain persistent through flowering, while in others the basal leaves are shed before flowering. The leaf margins are often serrated, and leaf faces may be hairless or densely hairy; the distal leaves are sometimes three-nerved, and hairless or sparsely to densely hairy. In some species, the upper leaves are stipitate-glandular or sometimes resinous. The flowering heads usually radiate with up to 1500+ florets in racemiform (club-shaped or pyramidal), paniculiform, or corymbo-paniculiform, or sometimes secund arrays. The corollas are yellow or rarely white and are usually hairless. The fruits are narrowly obconic to cylindrical in shape, and they are sometimes somewhat compressed. The cypselae have eight to 10 ribs usually and are hairless or moderately covered with stiff, slender bristles. The pappi are very big with barbellate bristles. Solidago virgaurea is native to Europe, and also grows in North America, Mexico, South America, and Eurasia. Goldenrod, sometimes considered a weed, grows in meadows, pastures, and waste areas in sun or part shade. Goldenrod grows well in any moderately fertile moisture retentive soil or heavy clay soils. Sow seed in the spring in a cold frame. Only just cover the seed and do not allow the compost to become dry. Transplant the seedlings into individual pots when they are large enough to handle, and grow them on for their first winter in pots. Plant them out into their permanent positions in spring or early summer. Goldenrod can also be propagated by division. Divide plants and plant the divisions in the garden in spring or autumn. The plant is harvested in the summer and dried for later use, hang the plant upside down to dry, then cut into finer pieces. Store dried goldenrod in an airtight container in a cool, dry place. Goldenrod (Solidago virgaurea) is a member of the Asteraceae family, to which daisies, sunflowers and asters also belong. Also known as woundwort and Aaron’s rod, goldenrod is a very prolific plant that can quickly spread if not contained. In fact, the plant is largely considered an invasive weed in the U.S. In Europe. However, various species of goldenrod have been cultivated in gardens for centuries for their graceful beauty and to make a flavorful tea from the flowers. Goldenrod is considered a boon to the gardener since the plant repels certain pests, provides food and shelter for beneficial insects and attracts honey bees. 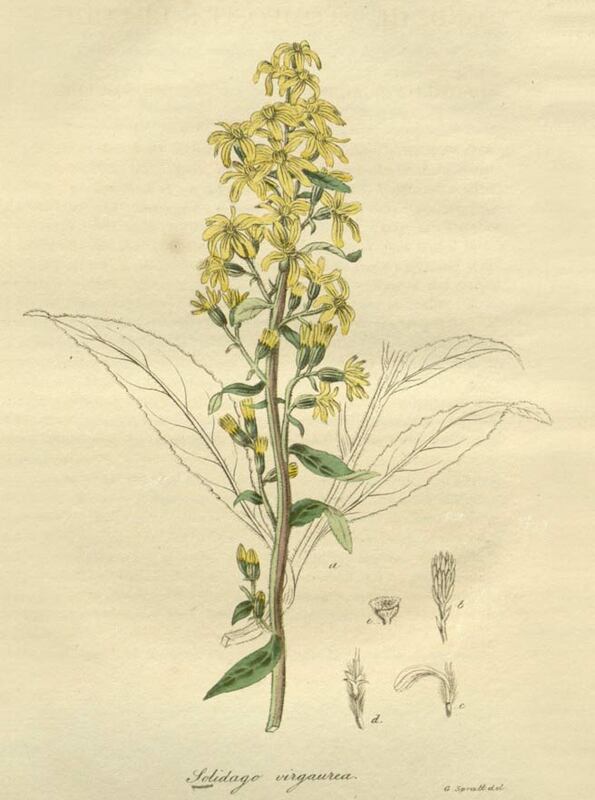 Goldenrod is often unfairly blamed for causing hay fever in humans. The pollen causing these allergy problems is mainly produced by ragweed (Ambrosia sp. ), blooming at the same time as the goldenrod.